This month Revista Atelierul is celebrating one of the most important events in life – marriage. 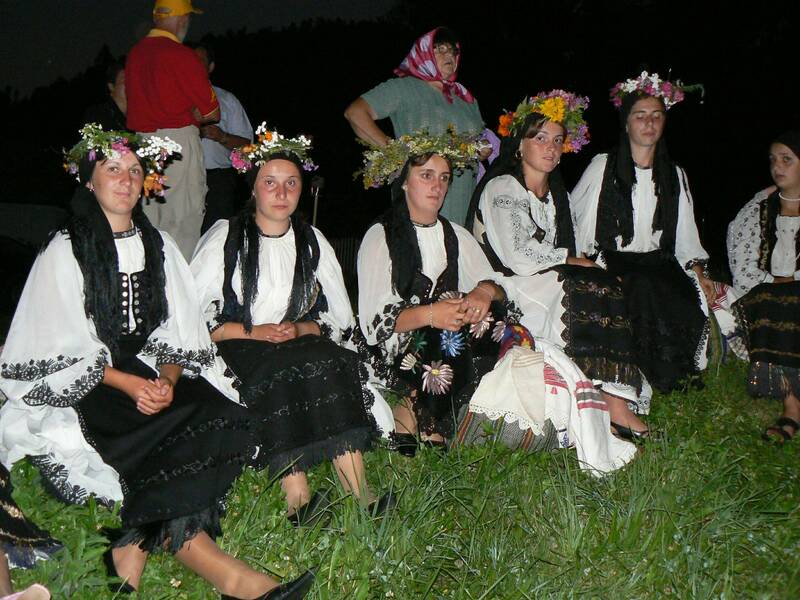 Revisita Atelierul contributor ramsmade investigates the famous Maiden Fair of Mount Gaina (Targul de Fete), and the legends and traditional rituals surrounding it. The Maiden Fair of Mount Gaina is held annually around the feast of St. Elijah for mountain families to arrange weddings for their unmarried children. The celebration can take many years of preparation for the girls, who must collect a dowry packed into beautiful carved chests. Tens of thousands of people meet at the borders of Hunedoara, Arad and Alba and Bihor to spend the night around fires enjoying music, dancing and other traditional festivities. Because legends are stories that have passed through time as stories, they undergo changes during the process and we do not know which is the original. So, let me tell you about both. *** The most popular version of the legend says that once there was a hen that laid golden eggs who lives up in the Apuseni Mountains. It was revered and protected by the people in the mountains. Once a year when they gathered for their children to meet the chicken came down from its nest. When the hen was about to descend, it beat its wings once and turned into a beautiful fairy. Approaching the newlyweds it handed them a golden egg which gave them happiness and a long life. But as every story has bad characters the legend tells that one year when the hen was descending the devil stole the golden eggs from the nest. When the hen turned saw the theft, it flew away never to return Since then mountain people meet every year on Mount Gaina with the hope that the enchanted fairy will appear again. *** In another version of this legend, the magic fairy and the hen that lays golden eggs are two separate entities. They say a fairy lived in the mountain and had a hen that laid golden eggs every day. Once a year, the fairy gave one egg to poor, quiet girls. This version also has bad characters. Five young thieves dressed up in women’s clothes crept up and stole the fairy mountain’s chicken and the golden eggs. Whilst running one of the robbers dropped the basket and the eggs rolled down the mountain far the rough waters of Aries river. The chicken then hid in the Abrud Mountain which, as is known, holds much wealth in gold. Angry, the fairy left these lands forever to other more distant horizons. Since then, young people climb to the top of Mount Gaina (1486 m) on the third Sunday of July hoping that maybe someday they will meet again. Traditionally, the ritual began on Saturday evening when the boys and men gathered. The young people would spend all night singing and drinking brandy. At dawn, the daughters and wives appeared, and the whole party moved to the crest of Mount Gaina. The girls were required to dance to prove to the boys that they were not lame. Merchants sold cherries and honey, brandy, or pails and glazed pots. The most important moment was the establishment of “târguirea” girls. Parents laid out food such as pies, fried chicken, brandy, and the boy’s father appeared for “negotiations”. Although the ethno-cultural event was first documented in 1816, it is probably much older. 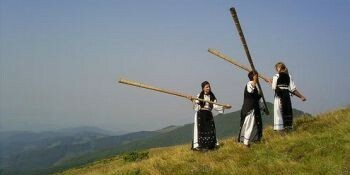 The Maiden Fair of Mount Gaina was registered as a trademark of Alba County Council at the State Office for Inventions and Trademarks and is a center of tourism for Alba folk and central Transylvania. Revista Atelierul is the first online magazine about handmade products in Romania.